February is the month of ‘LOVE’. With Valentine’s Day dominating the agenda, stores are filled with red roses, chocolates, red hot chillies and a wide range of novelty items. In amongst all of these you are likely to find Chamadorea elegans, more commonly known as ‘The Love palm’. ‘Love palms’ are small, slow growing palm trees, reaching a full mature height of approximately 1 metre. 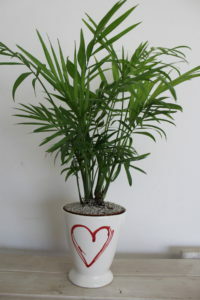 ‘Love palms’ are renown for their attractive foliage, compact shape and decorative cluster form. They are widely adaptable indoor plants – thriving in low to moderate light locations throughout the home and office. 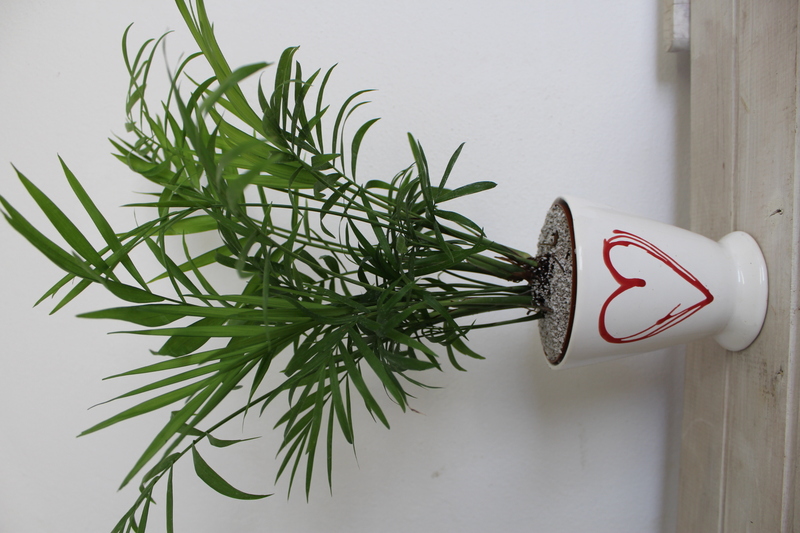 Unlike the typical Valentine’s Day colour options, Love palms will survive and last for several years! They offer an unusual, more sombre and ‘safe’ Valentine’s Day gesture that is ideal for friends, teachers and work colleagues. 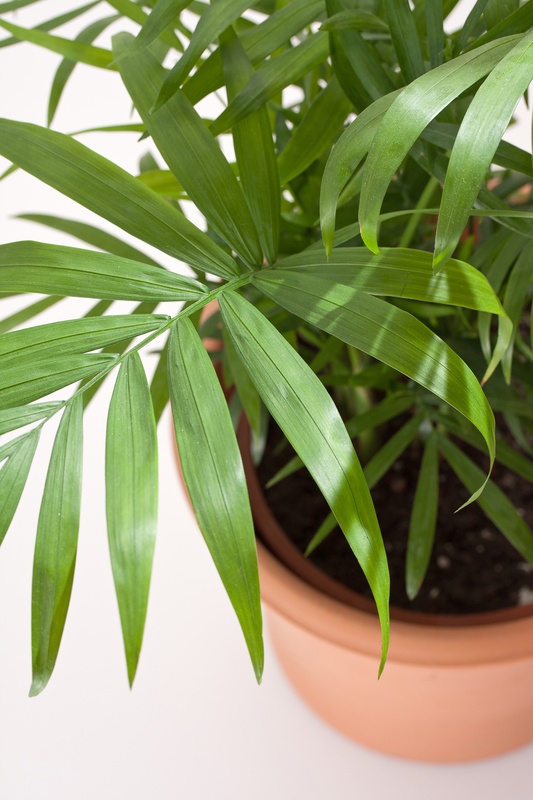 Love palms may be small in size, but they are pretty tough and hardy indoor plants, that are relatively easy to grow. To ensure success, position in a well-lit area, away from direct sunlight and breezes. The biggest threat to their successful growth is overwatering and ‘wet feet’ – if leaves turn yellow, halve the watering frequency (esp. in winter). Liquid fertilisers enhance and promote plant health. Standing the plant in a shallow bath of water for a few hours (or overnight) will ensure the soil medium does not completely dry out and this practice is recommended for plants that have been neglected, on a monthly basis. Over the past few decades, several indoor plants have been proven to improve indoor air quality by filtering toxic compounds from the air. Chamadorea elegans is amongst the top 10 ‘air purifying’ indoor plants and has the ability to remove benzene, formaldehyde and trichloroethylene. What does this all this mean??? Quite simply Love palms contribute to a healthier work and home environment – scientifically and also aesthetically. What a win! This tough little palm grows well in low to moderate bright light conditions. It should never be exposed to direct sunlight. As being a small plant watering is a breeze, in hot summer months make sure the soil stays moist but do not over-water. An easy method is to pick up the pot and feel the weight, if it’s light it needs water, if it feels heavy don’t water. In the cold winter months give it even less water less frequently. During the spring and summer months give a general soluble plant fertiliser or a foliar feed once every 2 weeks. Once your little palm has filled it roots in the entire pot, and has gained some height. It would be advisable to re- pot the palm into a “next size” pot. The perfect time would be in October through to January. Use a good quality potting soil. Common pest on the Chamaedorea is spider mites. These inconspicuous little critters turn the leaves pale white. Spider mites thrive in dry and hot weather conditions. Increase the humidity using a spray bottle or placing it in your bathroom.